At sundown, Sunday, December 2, Hanukkah officially begins and will last for eight days. But there’s more to the “Festival of Lights” than just latkes and menorahs — although, those are pretty major — and the Jewish holiday commemorates a very important point in history. 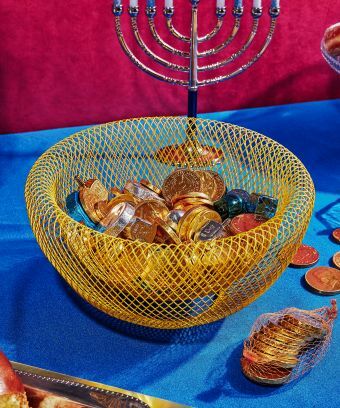 Hanukkah means “dedication,” and it celebrates a miracle that happened way back in the year 168 BCE, according to the Union for Reform Judaism (URJ). As the story goes, on the 25th day of the Hebrew month Kislev, Syrians destroyed the Jewish temple in Jerusalem. The Syrian king forbid people from practicing Judaism, and turned their temple into an altar for the Greek god Zeus. Meanwhile, a small group of Jewish people, called the Maccabees, fought the Syrians and and reclaimed their temple. However, after their victory, they only found one can of oil left over in the temple, that would only last for one day. They sent a messenger to go get more oil to light their menorah. It took this messenger eight days to get this new oil, but the solitary oil burned for eight days. And thus, the first Hanukkah occurred. Since the whole theme of Hanukkah revolves around miracle oil, foods cooked in oil are often eaten during the holiday, such as potato pancakes, called latkes, and jelly doughtnuts, called sufganiyots.